Posted on February 6, 2017 at 4:57 pm. The Macarthur region in NSW is enjoying a population boost, but that’s not the only thing that’s growing. Over the past couple of years the Macarthur area has received more poker machines than any other region in the state, with the influx of machines resulting in a vast increase in pokies revenue. The Macarthur region is made up of the local government areas of Camden Council, City of Campbelltown and Wollondilly Shire, and is one of the fastest growing regions in New South Wales. With several new suburbs popping up over the past few decades, the region has a growing population of around 279,000 residents, many of which are partial to the pokies, according to data released by ClubsNSW. ClubsNSW has revealed pokies in the Macarthur region generated $185.5 million in profit in 2016. That’s not the amount of money pumped into the machines, but the amount of money licensees made from them. Liquor and Gaming NSW show the total pokies turnover (the amount gambled on a machine plus its wins and losses) in the Macarthur area in 2016 to be a staggering $2.4 billion. The increase in revenue is either a sign of growing pokies problems or simply a result of the growing number of machines on offer. From 2014 to 2016, Camden increased its number of pokie machines by 82, giving locals access to 514 machines in clubs and pubs throughout the local government area. In 2016, Camden alone generated $28.1 million in pokies profit. That number will continue to grow after the Moorebank Sports Club announced plans to build a new club in Gregory Hills late last year. The amount of poker machines in Campbelltown actually decreased, but that didn’t stop the area from pulling in $149 million in pokies revenue. Camden state liberal MP Chris Patterson attests the increased number of poker machines to the number of new pubs being established and refurbishments in existing venues. Kirsten Shannon, manager for the Sydney University Gambling Treatment Clinic said 381 people reported to the Campbelltown clinic in 2016 seeking help with pokies addiction. “There is definitely a huge connection between the availability of poker machines and the number of people we see seeking help,” she said. 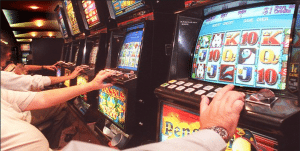 In 2002 the New South Wales government put a cap on the number of pokie machines allowed to operate in the state, with venues free to trade machines between themselves. The only positive to come out of this is that despite Macarthur receiving an influx of machines, the total number for the state has not grown. As the demand is clearly high in the Macarthur region, we can only assume more trades will happen and the number of machines on offer will continue to grow as licensees chase that sweet revenue while ignoring the statistics of growing gambling problems.